When checking out a new recipe, one of the first questions I ask is, how can I add more veggies? Sometimes it requires a little finesse, but boosting the health factor of Friday night’s dinner—a stir-fry—was a cinch. When it comes to stir fries, pretty much anything from the veggie world goes. The recipe I adapted included asparagus and red bell pepper. A good start, but we could do better. So while stocking up on ingredients for the weekend at Whole Foods, I also grabbed some sugar snap peas and mushrooms. That’s more like it. By the time dinner was served, I had about twice the amount of veggies (while keeping the quantity of meat the same) per serving than the original recipe. However, I learned from this experience that if I’m going to pile on the produce when making stir-fries I need to get myself a wok—stat. The pan I used was filled to the brim, which made my stir-frying action messy and spastic. (Typical, really, of what I look like in the kitchen anyway.) Fortunately, having two dogs came in handy. A delicious, comforting Friday night meal that beats take-out any day of the week. Whisk together the sauce ingredients through the chili oil and set aside. Boil a small pot of water on the stove. Once boiling, add the asparagus and cook about 1 to 2 minutes. Drain and set aside. Heat a pan with 1 Tbsp canola oil on high heat. Stir-fry the beef strips, in 2 batches, for 2-3 minutes until browned, but still pink inside. 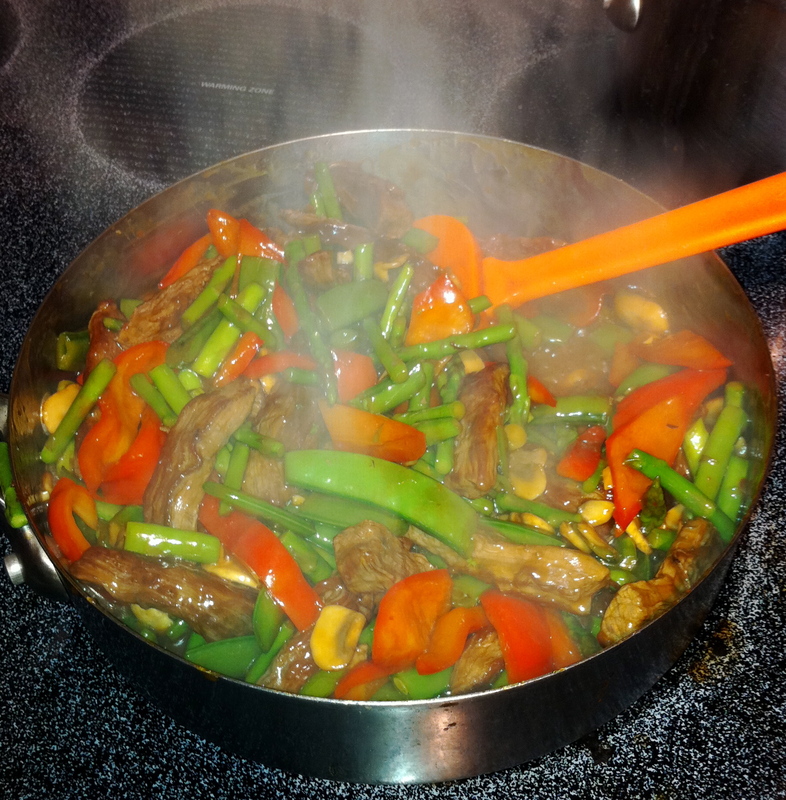 Return the first batch of beef to the pan and add the bell pepper, sugar snap peas, and mushrooms. Stir and toss over high heat until just beginning to wilt, 1-2 minutes. Add the asparagus. Quickly stir the cornstarch with the water and add it to the pan. Add the stir-fry sauce. Cook until sauce thickens, 1-2 minutes. Season with red pepper flakes & serve with brown rice. This entry was posted in Meat on September 18, 2011 by Paige Greenfield.